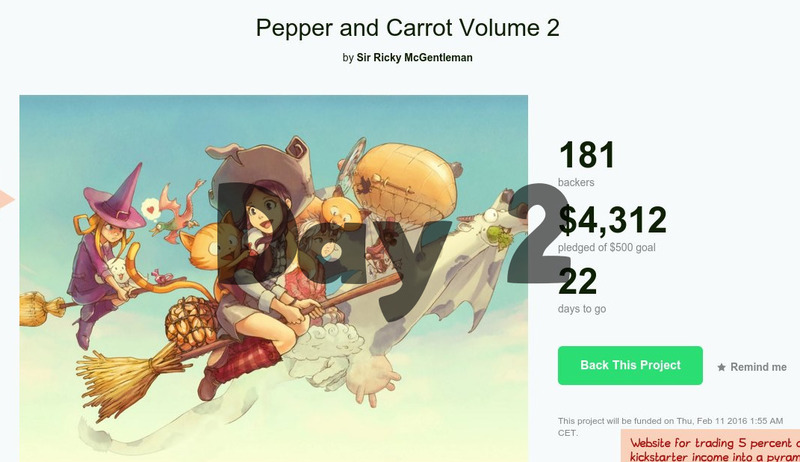 I compose here a new blog-post to give fresh news one day after the post "a Kickstarter campaign abuse Pepper&Carrot's license." about this kickstarter project . First, I want to thank you all for the massive help, questions and reaction. I tried to reply to many questions. Thanks also for all the suggestion I received to fix the website and explain better the CC-By 4.0 license. Sure, there is still room to improve the communication about it and I fixed little mistake here and here and I'll continue to work on it for the future. But Let be honest : on dozen of projects totally respecting the CC-BY rules, this one wasn't respecting them on purpose. It's not about the documentation. This author caused me a lot of trouble, and always play between legal/illegal, always shading himself behind a 'We', behind fictive company. 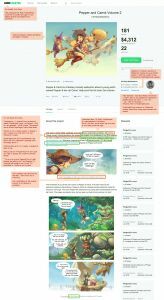 For those interested in more background, I recommend to read comments on the post of yesterday ( Here about the story of the first kickstarter , here about the NinjaKnight comic donation via Patreon ). 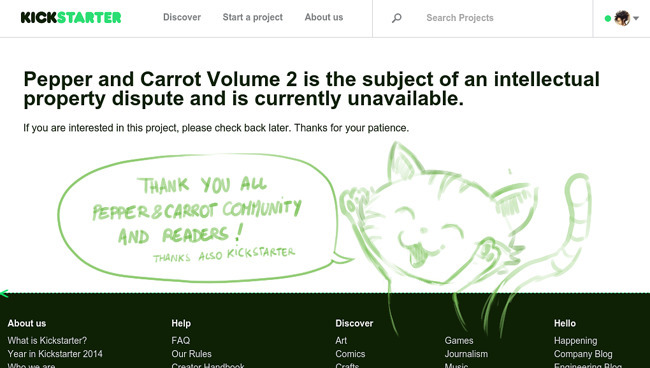 The kickstarter page has been turned down by Kickstarter , screenshot under with my first reaction. I also received an email from "Kickstarter Copyright" notifying me about the "hidden status" of the kickstarter page. Thank you. I'm open to discutions with Kickstarter, providing documents, screenshots, email discutions if they need. I'm 100% transparent and I write all I can publicly using my real name, hosting this project on my server and being 100% legal in my activity. The kickstarter page is back. Same version that the one seen in the morning. I received email from Kickstarter about the author claiming he did the necessary changes. He did ( same change than in morning ) . The page is almost fully compliant with CC-BY right now, and he clearly write I do not endorse the project. I'm ok to not fight more with this final result. Not ideal. Still many wrong things, many lies. "Not legit but legal". I requested Kickstarter to send a message to all his backer. They need to see the page updated with newer information, because they bought a lie. On my side , show must go on! Let focus now on future episode 14 ; and plan a real printing project for summer! I'm right now discussing with the Krita Foundation for an official ( one I endorse, with review on quality ) printed version in english with all benefit going to only free and open sources software I'm using ( GNU/Linux, Krita, Gmic, Inkscape... smaller projects too, as percent ). It will take time to setup and it will be scheduled for summer 2016. Thanks for your patience. License: CC-BY David Revoy, www.davidrevoy.com, 19 january 2016 . I was one of the backers of that campaign. This morning I got an email from Kickstarter saying that the project in question in under the intellectual dispute. My own belated mini due-diligence Googling landed me here. I saw you gave him a pass in the first one despite problems here and there. It's good that you took action this time. @Heesung Yang : Thank you, thank you very much! That is so good to read your comment, Heesung Yang. We all who love the work of David and his philosophy of working thank you! Glad to read that, I shared the case yesterday . I hope Kickstarter will remain vigilant with this type of project. @Tohad : Thank you for passing by, and for your reshare yesterday. Right now, this kickstarter page is available, still with a "trasnslation" from a Mike King. Seems exactly like the screenshot. wow... This is pretty horrid. I got here through a post on FB. I don't support that KS at all, but at least it's made me discover your webcomic and I'll be reading it soon, it looks amazing. Ha.... Indeed. The page is back. I understand nothing about it. Yeah, the page is back. Did Kickstarter email you anything? Confusing, somehow the project passed the muster? Well, thanks to Hex Designs' comment on the project page, at least two (including myself) people bailed out! Look at the comments by Hubert, Clocks Declaring, and Cally Lim. People should seriously wait until this summer for the print thing to be set up directly by the artist himself. Why run into the risk of getting a sub-par one? @Heesung Yang : Oh my.... thank you for let me know this. This guy is really a shame and should be really removed from Kickstarter if they care about their image , public relation and quality. I have canceled my pledge as soon as I found out, that I did not support the creator of this wonderful creation! I am overwhelmed from your beautiful artwork, its amazing! I hope I can help you a little bit and are going to pledge to your Patreon! Thanks to those guy who write a comment on the kickstarter campaign. Hopefully more people came straight away to this site and become a part of your beautiful community. @Rais : Thank you Rais, for your nice words, feedback and your action. It means a lot to me in this moment. It's a bit hard to have to fight against this McGentleman in the middle of my production of future episode 14.
this really is a shame ! reported again to kickstarter and i hope you can sort this out soon. I want to tell you I really apreciate your work and I was thinking I supported it through this Kickstarter campaign. I noticed the campaign founder and author were not the same people but I expected there was a true agreement between you two with a fair payment. I should have check it. I discovered a few minutes ago the truth. I hope enough people will ask to cancel this campaign to give you justice. It's ok : I found how to cancel the pledge : I had to lower the support before cancelling. I am sorry what happen to your commics, but I am afraid the bad boy is using your drawings in permited way. You select licensing CC-By and his ussage does not violate it. Am I right about the license? Is it really CC-By? If it is, Kickstarter has no legal reason to cancel the campaign. Sorry, but you are author, you choose the license. @Qaxi : Hi Qaxi. Thank you for your good words. Yes, It's Creative Commons Attribtution 4.0 international. Yes, the page of 'Sir Ricky McGentleman' is now edited to be 90% compliant with the CC-By license. I sent him way to meet 100% compliance, but he can already continue his business. I also requested Kickstarter to message all the previous 170 backers about the problem of endorsement. 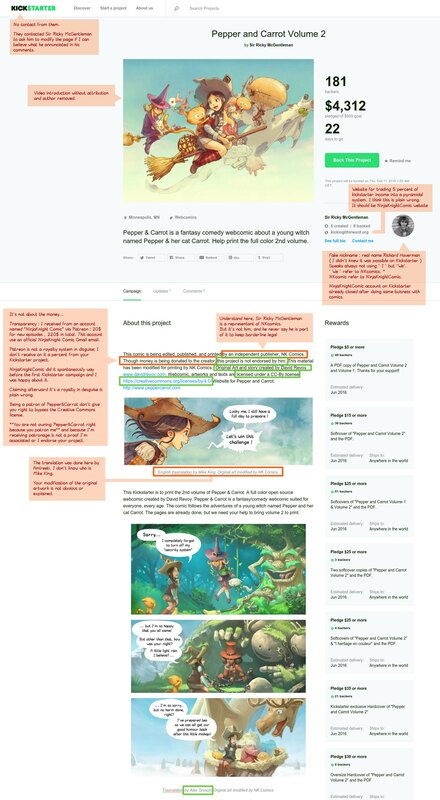 Probably a full week ran with fake informations, and I don't want this backers to believe they supported the artist. It's wrong. >> Attribution — You must give appropriate credit, provide a link to the license, and indicate if changes were made. - The impossible way to get reply from him, and from Kickstarter ( ethical issue ). Now we are in contact, and the page is getting fixed. Time to move on. I have no KS account or social network stuff, so I can just wish you to recover your mind tranquility soon to be able to continue to work on your dream with joy and happiness. I got very excited when I saw the kickstarter, less excited when I say the issues, and super excited when I saw the summer 2016 info. Can't wait. Pledge cancelled (had to lower it to 1USD first before the cancel option appeared)! Thanks to this post and the people who commented in the KS page. The email from Kickstarter talking about the project being available on the site again did not have any details about the change in information. Luckily, I checked the comments of the campaign to see what was going on. That bogus Kickstarter project is cancelled. Yes, I also wanted to write that the page says "Project canceled due to creative disputes." now! It feels like a final victory, haha. David, I hope your inspiration will not suffer from these events any more and you'll be able to get back to Ep.14 with full force! I really hope this guy looks for a new businessmodel now! I'm so happy this came to a happy end! That guy was clearly lying on purpose for own benefits, it's good the campaing got entirely cancelled even if the page was just about legal by the end. I'm so glad this was eventually all resolved and the Kickstarter was cancelled. I'm just wondering now what happened with the other artists and if they actually got any money from the previous kickstarters or not. It always angers me when people try and piggy back off artists and take advantage of goodwill to make money from work without even bothering to consult first. I swear the issue is with art people seem to think everyone owns it and no one thinks that someone took the time to produce the piece, not to mention how emotionally draining it is on an artist to see their work misused by others. They never seem to take into account what work means to an artist, it's not just a picture it's part of themselves that they are giving to others to enjoy. I respect you wholeheartedly for the amount that you give and don't expect anything in return, you are a true inspiration and amazing artist as well. I'm more than happy to join your Patreon to help with your dream of changing the comics industry. Thank you for doing what you do, plus with every bad apple (like Ricky) there are many more good ones who appreciate what you do and are touched by what you create. That McGentleman's creator page bio changed too. Generic "Customer Service Team Member account. Have a question, we have answers!". I suppose it's customer service team for some dubious company, whatever that might be. http://www.ninjaknightcomics.com They also seem to sell the comics on Amazon, I'm hoping they won't be selling pepper & carrot on Amazon to make even more profit. I'm not really shocked they're known for producing shoddy products considering the graphic design of their website seems sub par for a publisher. Maybe that's why the products are known for just being poorly up scaled and pixelated as they cut corners with even the editing. All mud slinging aside I doubt any respectable artist would want to be associated with this outfit considering how unprofessional it appears to be. Looking forward to episode 14!